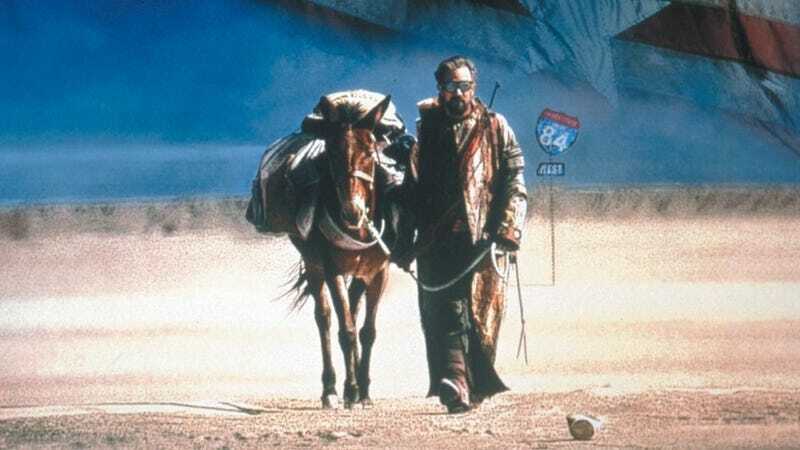 The Postman, the 1997 post-apocalyptic film by Kevin Costner, has a reputation as a critical mess and a box office bomb but on watching it I can’t help but feel it was merely ahead of its time. Don’t get me wrong, the film itself is flawed in places; it has a soundtrack that is annoyingly happy for the subject matter, a largely hamfisted romance subplot, random slow-motion shots abound, and it has a godawful music video scene but overall it’s a great film with a great cast, a good story (if slightly naive at times), and a world that gives you just enough backstory to keep you interested but not get weighed down in it. The film follows a man who is only known as ‘The Postman’, played by Kevin Costner, who is a lonely drifter that travels from town to town trading what he’s scrounged or acting for food. At one such town he gets caught and impressed into the army of the local warlord General Bethlehem, played by Will Patton, who largely rules the surrounding area through threat of force. Eventually escaping he seeks shelter during a storm in an old postal wagon, taking the uniform of the longdead Postal Officer. After buying his way into a nearby town by claiming to be a representative from the ‘Reformed United States Government’ there to deliver mail he becomes inundated with mail from the locals as he heads away to the next town. Word quickly travels back to Bethlehem of this threat to his power and he attacks the town, driving The Postman into exile for the winter. Upon return he finds that others have become postal workers, driven by his example, and are facing the threat of death if caught by Bethlehem. A serious of skirmishes and temporary disbandment of the postal workers leads to a final confrontation between the two forces and a one on one fight between The Postman and Bethlehem. The Postman wins this fight, taking command of their combined forces and making a peaceful way forward into the future. In terms of characters it’s a film that really stands out in terms of richness. Many films of the time and even after have failed to live up to this. You see hints of character backstory throughout without forced bluntness, such as Bethlehem’s background of being in the US Army and seeing the White House fall during the war which likely led to his hatred of the United States government, townspeople who are trying to find happiness where they can in a hard world, or the downtrodden just trying to find somewhere to belong. It’s this reasoning given to characters that adds to the world and makes it more believable. The film also stands out in the form of visual design and in many ways can be more described as a neo-western. Compared to the emergence of CGI in films at the time this one thankfully uses very little throughout. Instead the film relies on great set design and some of the best costuming I’ve seen in a film in a longtime. Everything has a nice battered rural feel to it with people trying to make the most use out of everything they have and to keep it running long past useful lifespan. Looking at films that have come out in the last 5-10 years it seems this film would’ve been more of a hit now than it was back in ‘97 and I can’t help but think it simply came out at the worst possible moment. This is a film not only in which the US loses a war but also has an anti-military, or rather anti-uncontrolled military, streak to it so coming out just after we ‘won’ the Cold War and the successes of the Gulf War it probably didn’t fit into the realities of the time. It wouldn’t be until after 9/11 and the disasters of Afghanistan and Iraq that films where the ‘good guys’ lose and the world as we know it ends became profitable or enjoyed again. Overall The Postman is a story of hope in a world where people don’t really have much and expresses it in a variety of ways, whether that be sharing news via mail or celebrating with your friends at the end of the day. It’s a film with a good soul to it that seems to have been slammed because of a few flaws and its setting but it set many of the traits we see in more modern tales, such as the isolation we see in I Am Legend or the western feel we see in Book of Eli, and fans of more modern ‘CG-less’ films like Mad Max: Fury Road but with a more hopeful story should check it out.